Should be suitable for drying of respiratory accessories, hollow tubes, breathing bags, surgical instruments anaesthetic hoses and other reusable items. 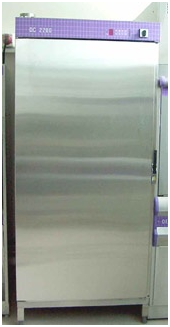 The body should be made up of high quality AISI 304 Stainless steel and should have heat and sound insulation. Should be equipped with spun fiber pre-filter to remove airborne particles. Should have microprocessor based temperature controller with adjustable temperature for heat sensitive parts . Should have time regulation 1-99 min or continuous and should have remaining time indicator. Temp. adjustment up to 93 deg. C.
At least three factory pre-set programs and provisions to add at least two other programs by user. It should be certified by international standard organizations like CE /ISO. The system should be supplied with 3 removable wire shelves trays, holder s shelves for long AN- hoses, and two hose cassettes. Should have a control panel with programme selection and start button, digital thermometer, programme , phase display and service error display on LCD/ LED digital display.